On Thursday 20 March 2014, Sandro Paris women’s designer Evelyne Chetrite hosted West Coast media, influencers, and celebrities at the Chateau Marmont to celebrate the expansion of their French Contemporary line, Sandro. The evening included a private dinner followed by an exclusive party featuring a live performance from indie-rock band Polica. Known for its clean lines and sophisticated aesthetic, Sandro is a premium Parisian brand featuring refined and versatile men’s and women’s collections. Since 1984, it has been creative director Evelyne Chetrite’s eye for detail that has made every Sandro collection special, feminine, and distinctly French. In line with the Sandro sensibility, Evelyne’s son, Ilan, launched Sandro menswear in 2008. Today, Sandro has over 240 stores worldwide, including the brand’s nationwide expansion in the United States. The bungalow of the Chateau was transformed into a chic Parisian apartment that exudes the spirit and attributes of the brand: chic, subtle, refined, warm, approachable, clean lines. The scene was a mix of modern and vintage furniture. 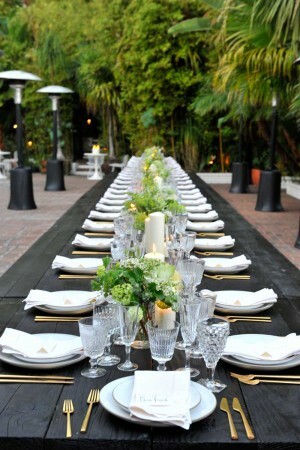 The evening began with an intimate dinner poolside with Sandro founder and creative director, Evelyne Chetrite. Guest Jenna Malone performed poolside for the dinner guests before the party moved inside for live performance: Poliça. Chris Holmes and friends provided the DJ set for the remainder of the night.